You’ll find here a range of tools, mostly free, to suit every individual’s approach to getting their designs seen by potential customers on Social Media (Pinterest, Twitter and Facebook). There are tools for peeps who don’t have websites but still want a webpage to show off their Zazzle or Society6 creations, and tools for people who keep professional stores that include Zazzle and or Society6 sections / departments. In all this, the biggest benefit to you is that you save time while mightily increasing your reach. And the time you save is better spent creating and designing! This site is the official home of the Nifty range of promotion tools for Zazzlers and S6ers. 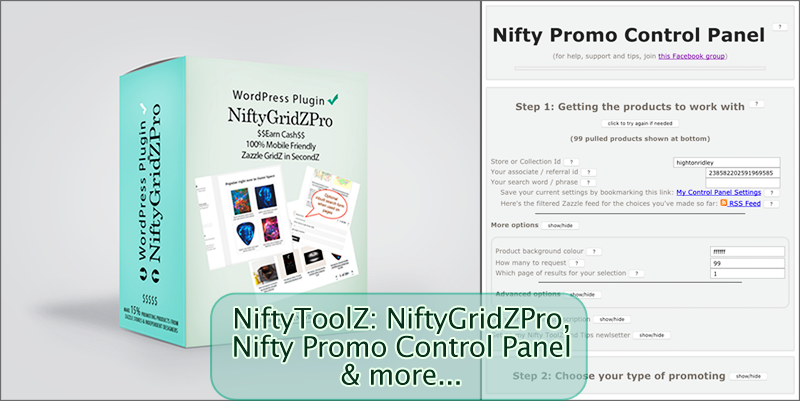 Find out about the WordPress NiftyGridZPro plugin (Zazzle only) and all the other Nifty tools over in the navigation menu.